FRANKFORT, Ky. (AP) — When the #MeToo movement swept across the country, triggering a national reckoning about sexual misconduct, some politicians lost their positions and power amid such allegations. Many others did not. As voters return to the polls this year, The Associated Press has found that scores of politicians accused of sexual misconduct are running again and poised to win — particularly in state races. That includes the deposed speaker of the House in Kentucky, who despite an ethics commission reprimand is running unopposed. Of the 25 state lawmakers who are running for re-election despite allegations of sexual misconduct, 15 have already advanced to the Nov. 6 general election. Seven did not even face a challenger in their primary. One example is Jeff Hoover. A sexual harassment scandal cost the Kentucky House speaker his leadership position in January. An ethics commission fined him $1,000 and publicly reprimanded him. Gov. Matt Bevin, a fellow Republican, even called for him to resign his House seat. But after all that pressure, Hoover is running for re-election, and no one filed to run against him. 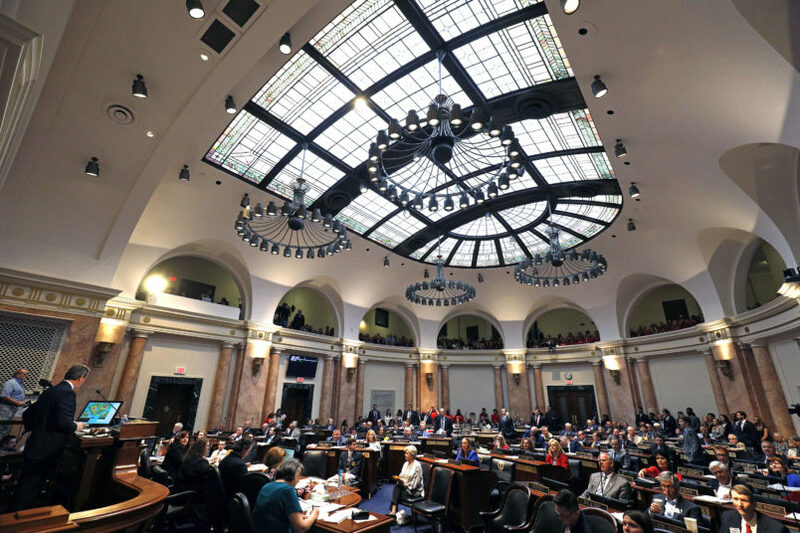 Kentucky has seen seven lawmakers accused of sexual misconduct since 2013. Hoover was one of four Republican lawmakers who signed a secret sexual harassment settlement outside of court. Of the other three, two opted not to run for re-election. One, Michael Meredith, easily won the GOP nomination in May with 65 percent of the vote. He will face a Democrat in November. Kentucky Democratic Party spokesman Brad Bowman said party leaders tried to recruit someone to challenge Hoover but the candidate got cold feet just before the deadline. Hoover’s district has been a Republican stronghold for decades. Allegations against other Republican lawmakers have surfaced since the filing deadline. In March, a 2015 memo from the former chief of staff of the House Republican Caucus said a female state employee filed a complaint against Rep. Jim Stewart for “unwanted verbal advances.” Stewart denies the complaint exists and state officials have refused to release any documents. Stewart faces Democrat Debra Ferguson Payne in November. Payne, a retired teacher, said she does not plan to use the accusations in her campaign. She said she despises negative campaigning and wants people to elect her for her own ideas. Plus, she said criticizing Stewart over the allegations would likely backfire. The extraordinary growth of the #MeToo movement led many to believe that accused office holders would be political pariahs, but that has not been borne out on the state level. By comparison, virtually every member of Congress accused of sexual harassment has resigned or opted against running for re-election. Kelly Dittmar, an assistant professor of political science at Rutgers University, said the relative political success of accused state lawmakers suggests that voters are unsure how to respond. Does a private failing disqualify someone from serving in public office? “We don’t have an answer for that,” Dittmar said. In California, of the six state lawmakers who faced misconduct allegations and ran for re-election or another office, four advanced to the general election. That includes two women. Assemblywoman Cristina Garcia, an early advocate for legislative changes in support of the #MeToo movement, was the top vote-getter in a crowded June primary for her Los Angeles-area district. She took a three-month leave of absence earlier this year after a former legislative staffer accused her of groping him in 2014. Investigators initially cleared Garcia of the charge, but her accuser appealed the findings and the investigation has since been reopened. Garcia has denied any wrongdoing. In Arizona, former state Rep. Don Shooter was expelled from office after he was criticized for a pattern of sexually harassing women. He apologized, but now he’s back, running in the Republican primary for a seat in the state Senate. His opponent in the August Republican primary, Sen. Sine Kerr, said she has no plans to highlight the allegations against Shooter. Advocates say lawmakers’ success in these races is a reminder of a long history of legislators tolerating bad behavior among their colleagues and highlights the need for more accountability and equal representation in statehouses around the country — where women are just 1 of every 4 lawmakers.